Happy to help on this awareness campaign. All it takes is to just to remember to ask for the PSA test to be added to your blood workup next time you’re in for a physical. It’s no big deal. 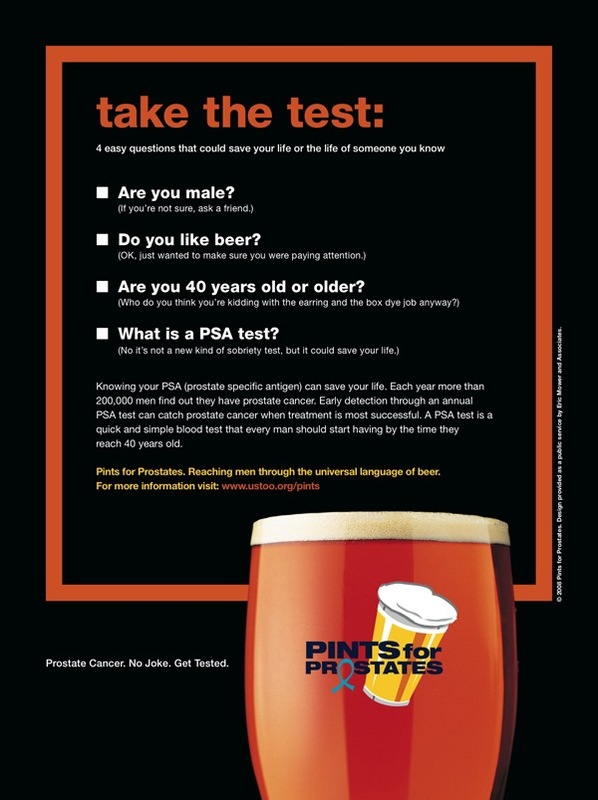 Pints for Prostates is a grassroots effort to reach men with a critical message about prostate cancer screening using the universal language of beer. Started by prostate cancer survivor and drinks journalist Rick Lyke, the goal of the program is to communicate with men in a friendly and non-threatening way about the need for regular prostate health screenings and PSA testing. Recent studies have shown that PSA screening does a great job of discovering prostate cancer but doesn’t translate into many saved lives. Some prostate cancer is so slow growing, it does not cause death, but screening can’t predict how fast a man’s cancer will grow. The news is confusing to middle-age men who have been urged to get the test annually to reduce their chances of becoming a casualty of the No. 1 cancer killer of men. Despite the American Cancer Society guideline that men start getting routine PSA screening at 50, Lyke thinks men ought to start at 40.